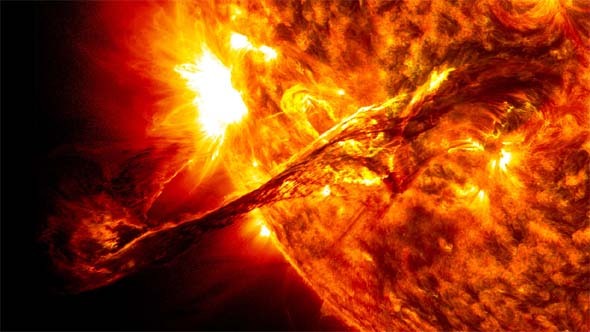 Could a Coronal Mass Ejection End Civilization? Asteroid impacts and super volcano eruptions have been in the news the past few years as events that send us back into the Dark Ages, but the real threat might be something you may have never even heard of: a Coronal Mass Ejection. Fred was sitting and reading his evening paper in his North Philadelphia home when the lights went out. A quick glance outside confirmed it wasn't just his house, but the whole neighborhood. This was odd as the sky was clear with no sign of bad weather. Then Fred stepped outside and saw it: The upper atmosphere was lit with a shimmering curtain of red light. Well, at least they would have something interesting to look at until the power returned. On September 1, 1859, British astronomer Richard Carrington was in his observatory. He had set up his telescope to observe the sun by having it project an image onto a piece of white paper. As Carrington watched, he saw something he had never seen before: over a five minute period several blobs of blindingly-white light appeared on the paper, then faded. Carrington had seen solar flares before, but nothing like these. The astronomer sketched what he had seen onto the paper, puzzled by what it meant. A day later he found out. The night skies overhead lit up with vivid displays of red, blue, and green auroras. Instead of the northern lights just being visible in the northern latitudes, they appeared as far south as Hawaii. In New York they lit the sky so bright that at midnight a newspaper could be read outside. 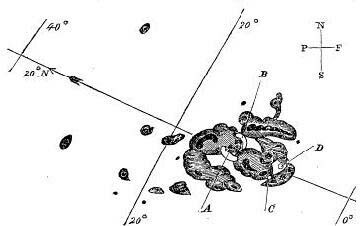 Richard Carrington's sketch of the odd, white solar flare of 1859. 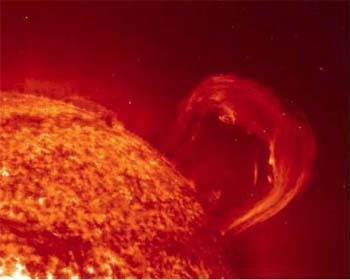 What Carrington had observed was the largest recorded coronal mass ejection (CME) in history: billions of tons of plasma being shot out from the sun towards earth. Normally, when clouds of plasma like this hit the earth's magnetic field, they follow the field lines down into the polar regions where the plasma collides with Earth's upper atmosphere and creates the aurora borealis in the north and the aurora australis in the south. Usually these displays are limited to just the polar regions; however, the CME of 1859 was so strong that it drove the Northern lights far, far to the south. A large CME can also cause Earth's magnetic field to fluctuate. This, in turn, can induce electrical currents in any object on the planet that can conduct electricity. This effect is called geomagnetically induced current or GIC, for short. In 1859 the geomagnetic storm caused by the CME was so powerful that telegraph operators found that they no longer needed to connect batteries to their lines as the GIC had given the lines enough energy to power the system alone. Other operators suffered shocks from the induced current or even found the paper the telegraph machines used was being set on fire by electrical sparks. The fluctuation of the magnetic field also drove compasses crazy for a few days, making navigation difficult. Despite all the excitement at the time, the Carrington Event, as we call it today, didn't really have any lasting impact on the world. As soon as the CME passed by Earth, the compasses went back to normal and the telegraph stations fixed whatever minor damages they'd experienced and started transmitting messages again. And on the plus side, Carrington's observation of the flare, immediately followed by the brilliant night-time displays, helped scientists connect the two events together to give us a better understanding of how the northern and southern lights actually worked. What would happen, however, if a Carrington-like event were to occur again in modern times in a world highly-dependent on electrical systems? Would everything be back to normal in just a couple days? Or would there be more serious consequences? Could CME Cause Nuclear Meltdowns? Most modern nuclear power plants continue to produce heat for months after they shut down. So much heat, in fact, that unless the coolant is continually run through the reactor, the nuclear pile can melt down, leading to deadly radiation contamination of the air and ground water. This is what happened to the Fukushima reactor complex in Japan when a tsunami hit it, shutting down the reactors and flooding the emergency generators that were supposed to keep the plant cool. If a geomagnetic storm forced a nuclear plant off-line and off the power grid for any extended length of time, its emergency backup generators would run out of fuel and a meltdown could result. As the damage from a geomagnetic storm could be widespread, dozens of nuclear power stations might find themselves in this catastrophic situation. Fred's radio was silent. The batteries worked fine, but it seemed like there were no stations on the air. His cell phone didn't work, either. After twenty-four hours without communications, rumors started floating through the neighborhood: The power would not be coming back. Not for at least six months to a year. Fred headed to the local hardware store to see if he could buy a generator. the store was mobbed and there were fights breaking out over who would get the last of the portable power units. In 2013 Lloyd's of London, the insurance brokers, tried to assess the damages that a Carrington Event would have on modern electrical and communications systems should one occur today. In the worst case scenario that they came up with, there was a staggering figure of 2.6 trillion dollars in damages. They believed that "such an event today would affect between 20-40 million people in the US with power cuts lasting from several weeks to 1-2 years." Our modern world is much more dependent on electricity than it was in 1859 both to power our machines and run our communications. Our modern homes use electricity to keep them cool in the summer and warm in the winter (even gas or oil heating systems require electrical controls and fans to circulate the air). We keep our food electrically refrigerated at both our homes and in commercial establishments. Often fresh water comes to our homes from water towers, but it has to be pumped by electricity up into those towers in the first place. At service stations gas and diesel for our vehicles are pumped out of storage tanks by electrical motors. So our day to day lives are highly dependent on our complex electrical power grid. While a lot of electronic systems and devices could be damaged by severe GICs from a geomagnetic storm, the electrical grid, however,is probably most vulnerable of these to a failure in the case of a Carrington-like event. Just as in 1859 when the telegraph wires got charged by GIC, modern power lines can find themselves overloaded during a CME geomagnetic storm. This can, in turn, overload transformers connected to those lines, causing them to overheat and even burst into flame. Most of these larger transformers connected to high power lines would not be easily replaced if they were damaged. They are specially designed for their roles in the power system and it can take longer than a year to build a new one and get it installed. Now when one of these large transformers malfunctions by itself, it isn't a huge problem for a utility. They can shift some of the work to other transformers. But suppose a Carrington event were to put all the large transformers out of service at a utility? Customers might not see electrical power restored to their homes and businesses for months or even years. The United States has recently faced a few major problems with its power grid. In August of 2005 Hurricane Katrina knocked out power for about 2.6 million people in the southern United States. In October of 2012 Hurricane Sandy came ashore along the coast of New Jersey and over 8 million people lost power in the Northeastern states. In both cases even with utility crews coming from across the country to assist local workers with getting power restored some customers were without power for months. A large CME like the Carrington event might occur nationwide or even world-wide, spreading restoration crews extremely thin. This would greatly delay repairs and create a gigantic shortage of replacement parts. Fears of a power outage caused by a CME aren't just theoretical, either. In 1989 a strong geomagnetic storm hit North America. The power system in Quebec, Canada, was overwhelmed in less than a minute and the province was plunged into a blackout that lasted 9 hours and affected six million people. At the same time in New Jersey, USA, the power system teetered on collapse after a large transformer succumbed to a GIC. It was only saved at the last moment because the utility was able to import electricity from surrounding power grids. The 1989 storm that caused all this trouble, however, was just 1/3 of the strength of the Carrington Event. 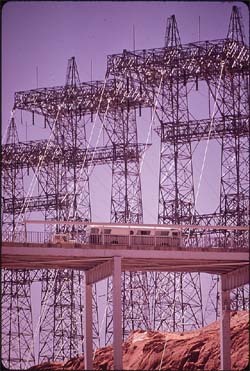 Despite the problems in 1989 and the realization that earthy power lines could be damaged by celestial events, not much was done to improve the situation. No regulations were added requiring utilities to harden their facilities against a geomagnetic storm. In fact, the whole system was made more vulnerable by adding lines and making the grids more interconnected. This makes what happened on July 23, 2012, extremely frightening: An immense solar flare on the sun resulted in a CME at least as large as the Carrington Event being shot out and directly through Earth's orbit. The planet was only saved because it had moved past that section of its orbit a few days before. A very, very, near miss. According to Daniel Baker of the University of Colorado who worked on a study for NASA about the incident, "If it had hit, we would still be picking up the pieces." He also added, "I have come away from our recent studies more convinced than ever that Earth and its inhabitants were incredibly fortunate that the 2012 eruption happened when it did," says Baker. "If the eruption had occurred only one week earlier, Earth would have been in the line of fire." What's more, a recent study by Pete Riley of Predictive Science Inc, estimated that the chances of a Carrington-like event hitting Earth head on is a sobering 12% over the next decade. A CME could take down power girds around the world for over a year. Unfortunately, governments have continued to move slowly to handle this threat. NASA has a project underway, Solar Shield, that would detect an Earthbound CME and predict where it might do the most damage. (It was one of NASA's satellites for this project, STEREO-A, that alerted scientists to the 2012 event). With this information, power utilities could shut down vulnerable equipment until the damaging GIC had passed. This would result in a blackout for customers, but only one that would last a few hours, not months or years. Other agencies are looking into how to make wiring changes to the electrical systems to harden them against GICs. The question is whether these protections will be effective and in position by the next Carrington Event. As the events of July 2012 show us, it's not a question of if we will be hit by a CME, but when. It's six months after the power has failed and Fred and his family find themselves along with thousands of others in a government shelter. Food is getting more and more scarce. There is no sign of electricity in Philadelphia, though some of the cities in the western United States have gotten their power back. Government workers come by every few days checking radiation levels. Without emergency power, the Limerick Nuclear generating station in Pottstown has had a meltdown and much of the land northwest of the city is now inhabitable. Fred realizes that even if the power comes back in a few months, his world will never be the same.